My old house….lovely lanterns, cobwebs and all. Hi there! Come on in! Welcome to my house. I am so glad you stopped by for a chat! Excuse the mess, we always have a project going on. And my son usually has action figures and pb & j crusts on every surface. When we first looked at our house our Realtor warned us. The 1935 house was being sold “As Is”. Which meant there were issues. Like rats in the basement. Mice in the kitchen. Raccoons on the roof. And other unpleasantness. But, he reassured, he liked to call this place “The Shock and Awe House.” For every shocking angle, there was something amazing about it. That was a bit of an exaggeration I think. 4600 square feet of mostly shock and only some awe. It wasn’t just that it wasn’t all fancy and pretty, it was actually unlivable. Appliances didn’t even work. Here are some before photos. Sorry the quality is poor, but trust me, even better quality photos couldn’t make these rooms look good. There are more photos, and trust me, they are every bit as bad. 4600 square feet of shocking moments on all three floors. I visited the house three times before I could even stomach the idea of taking this place on. It was truly horrifying to me! Built in 1935, the current owners had lived in it for the past forty years. And sadly, they had done some not so beautiful things to it in about 1979. And many of the things were too expensive to undo–maybe ever. Like a crazy dormer addition right on the front of the house and the ugliest accordion garden window stretching across the back of the kitchen. If those hideous changes were not enough, the owner had smoked in the house and everything reeked of cigarette smoke. A beautiful covered porch, the veranda, was falling down outside. Many rooms had dreadful wallpaper. The slate on the patio was coming undone. There were five bathrooms that needed attention. Oh, and there were wheelchair lifts in the stairways and hospital beds in the bedrooms, among other things. But, on the brighter side, it had beautiful Mahogany walls in what the Realtor called “The Ballroom.” A living room with wide pegged wood flooring, stone fireplace, antique light fixtures, huge windows looking out over the forest outside and a beautiful antique square baby grand piano. That was the room that sold the house. You just can’t buy a house with a room like that anymore. Unless it is horrible everywhere else. This house still had original woodwork and board and batten walls from the 1930s. We, being the fools we are, decided we could save this house. So, with offer in hand, we called the Realtor. Unfortunately, the owner had died that morning. The house now belonged to her son. And that was the beginning of a saga that was almost comical, except it wasn’t. I’ll spare you the details here, but it involved fleas on three inspection days, a painting from the 1800’s hidden in a safe room, and about a dozen raccoons. Four years later we are still working on this house. If we had a large bank account maybe we’d be done by now. But, we have to go one step at a time and do more with creativity than funds. We’ve torn down “the veranda,” carted off the raccoons, shut out the rodents (well, most of them), ripped off wallpaper and remodeled the kitchen. We’ve used my famous “creative concealment” tricks on a few ugly features. We’ve ripped out 1970’s paneling and painted walls. Things are looking better, but we have a long way to go. Decorating for now is definitely taking a backseat to bigger projects. I really haven’t decorated anything yet. I’d say in about 20 years things ought to be looking pretty good around here. 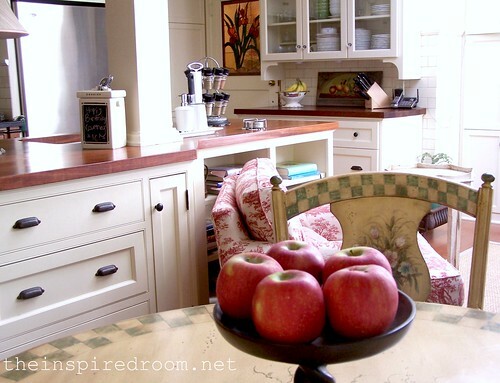 …no more oak veneer on the walls and cabinets. 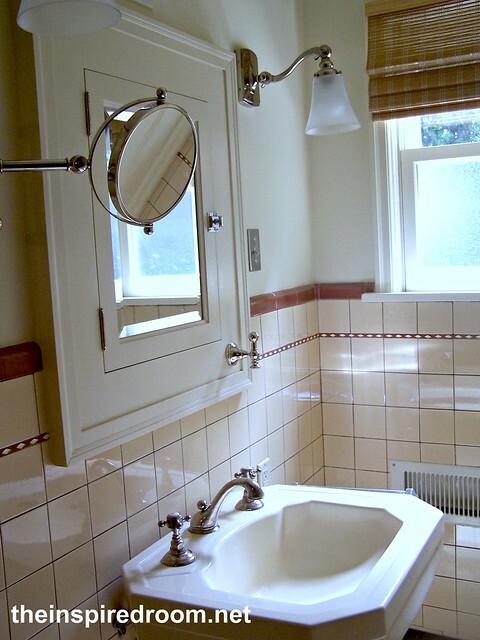 I love the subway tile from Pratt & Larson in Portland. We used four or five different knobs or pulls in the kitchen for interest and variety! All from Rejuvenation in Portland except for the glass pulls, from Restoration Hardware, Portland. We had this cabinet made with real bamboo trim. then glued the trim around the drawers! 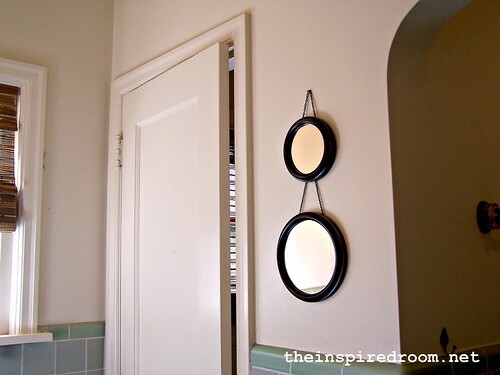 These hammered metal pulls are from Rejuvenation Hardware in Portland. Here you can see the original combed plaster walls. They don’t make ’em like that any more! We left the original tile in the bathrooms wherever possible. It was in great condition and very vintage chic! I know some people rip out tile like that but WHY? This bathroom room had horrific wallpaper so we just stripped it and painted. We put in new faucets, lights and medicine cabinet. just like the original board and batten in the house. Here is a back staircase makeover, so much work but I loved the result! Check out the stair makeover post! This bathroom had black velvet wallpaper. Oh boy. Stripped the paper, painted the walls and that was it! 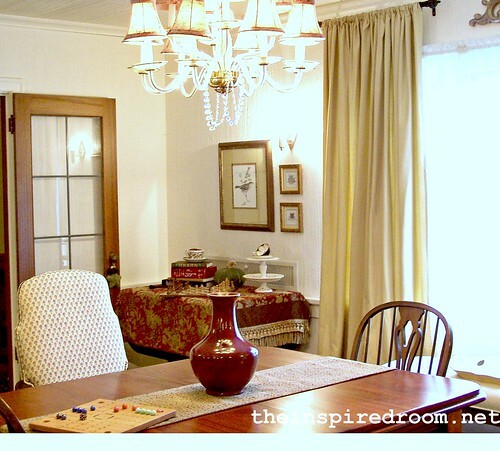 We had lots of crazy room makeovers and things to cover up in this house! 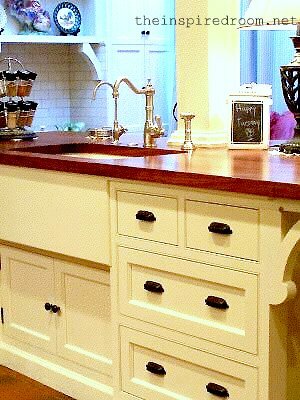 To see the ideas I used for my old kitchen remodel, click here. To see the new house kitchen remodel, click here. We finished this house as best we could when my husband accepted a job in a new state and we put it up for sale. After a long ordeal trying to sell in this difficult economy, we finally sold it and began our life near Seattle. It was hard to leave our home, especially my kitchen!